As wildfires ravage the state of California, moviegoers may not be especially excited to sit down and watch a 130-minute reminder of how dangerous and frightening it can be to see fires tear across the landscape. But in a way, it’s surprisingly easy not to think about current events during Only The Brave, and not through sheer obliviousness. Joseph Kosinski’s fact-based account of the Granite Mountain Hotshots, a group of Arizona firefighters whose de facto battlegrounds included the devastating Yarnell Hill Fire of 2013, is so squarely old-fashioned that it’s a little jarring to notice that many of the characters have smartphones. The term “hotshot” is spoken repeatedly in Only The Brave, and it takes some adjustment to realize it’s not a nickname or an adjective but an official designation for teams trained to work on the front lines of wildfires—often literally fighting fire with fire. 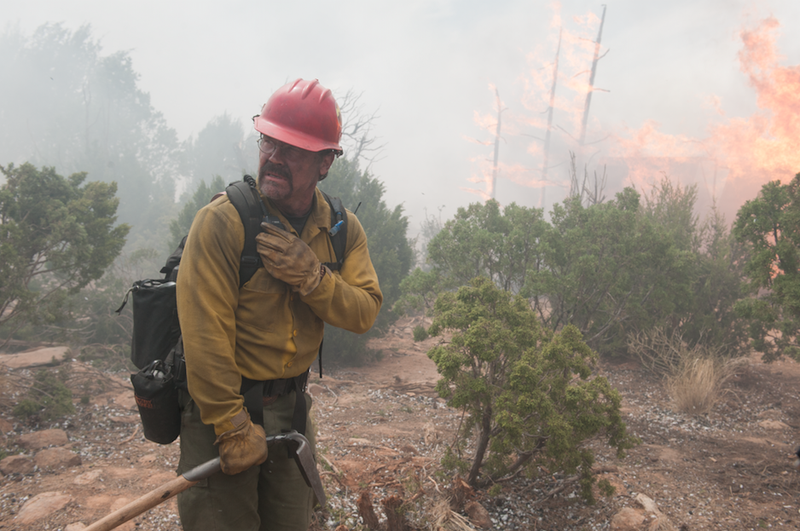 The movie begins before the Granite Mountain crew has achieved this designation—they’re “type 2” firefighters who hang farther back—with supervisor Eric Marsh (Josh Brolin) desperate for the upgrade. Marsh is portrayed as sort of a fire whisperer, able to evaluate where and how a wildfire will spread but less adept at communicating his point of view without irritating his superiors. Marsh is better liked by his crew, including new guy Brendan “Donut” McDonough (Miles Teller, bleached blond and leaning into his ability to look hollowed-out), first seen as a burnt-out junkie learning that his ex-girlfriend is pregnant with his kid. Trying to shape up for his new daughter, he approaches Marsh about a job, and Marsh takes a chance on him shortly before Duane (Jeff Bridges) wrangles him another evaluation for hotshot status. The movie liberally and repeatedly skips ahead in time to make sure Brendan is properly bonded with the rest of the sprawling crew, the most prominent members in a sea of strapping white dudes being Jesse (James Badge Dale) and Travis (Geoff Stults). 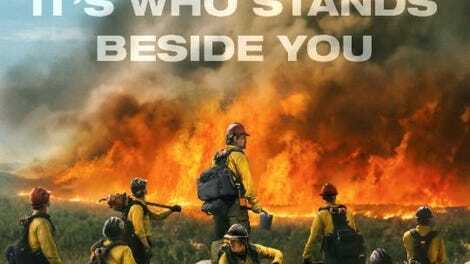 The action nominally builds to the Yarnell Hill Fire, but Kosinski seems happy to bask in the male professionalism and camaraderie, even if few of the specific male professionals emerge as compelling characters. Only The Brave does make an effort with the potentially stock role of Marsh’s wife, Amanda (Jennifer Connelly), by giving her an interest beyond making or taking tearful phone calls—she’s a rancher, and less deferential to her husband than might be expected from this sort of material. Although Brolin, Teller, and Connelly are compelling enough, the real spectacle of Only The Brave is watching Kosinski, who previously directed Tron: Legacy and Oblivion, strip away his science fiction dressings and still find an otherworldly sheen underneath, even amid all this natural beauty (and destruction). Kosinski and his returning cinematographer Claudio Miranda (who also shot Life Of Pi) are experienced in the art of digital imagery, and they capture beauty in images both relatively mundane, like a hose dangling from an initially unseen firefighting helicopter, drawing water from a swimming pool, and genuinely strange, like a recurring image of a bear charging out of a forest on fire. Even the movie’s two-character conversations are often beautifully lit and shadowed, integrating the characters into their landscapes. Despite the lack of robots or clones, though, the gorgeous photography of a vaguely interesting but not especially grabby narrative very much brings to mind Kosinski’s previous films. All of his work so far has toyed with the balance between style and substance; as yet, the former isn’t quite developed enough to serve as the latter. At some point—at least for those unfamiliar with the true-story source material—Only The Brave becomes an exercise in waiting to see who receives a fallen hero’s tragic fate. It’s a stirring tribute, yes, to see these real-life heroes rendered in their own modern-day Howard Hawks movie, but in its final stretch, that tribute wallows in the tears and the wails of those left behind, maybe because it doesn’t have much else to do. In the face of human emotions, its craftsmanship turns workmanlike.